Ginger Meggs, a popular long-run Australian comic strip, was created in the early 1920s by Jimmy Bancks. The strip follows the escapades of a red-haired prepubescent mischief-maker who lives in an inner suburban working-class household. While employed at The Bulletin, Bancks submitted cartoons to the Sydney Sunday Sun, where he began his Us Fellers strip in 1921 in the "Sunbeams" section of the Sunday Sun. Ginger first appeared in Us Fellers on 13 November 1921, drawn by Bancks. Bancks died 1 July 1952, from a heart attack. Ron Vivian took over the strip, followed by Lloyd Piper, James Kemsley and Jason Chatfield. 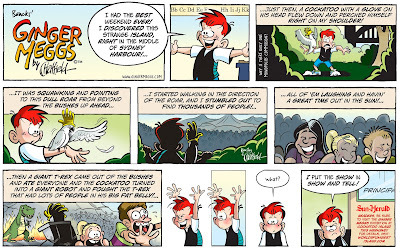 A Ginger Meggs cortoon strip made for an exhibition appeared at the Worlds Funniest Island comedy festival on Cockatoo Island in Sydney in 2009.